Spike Reid, a Design for Industry graduate and former president of Northumbria Students’ Union, spent 98 days travelling more than 1,800 miles along the Ganges – the most polluted big river in the world. 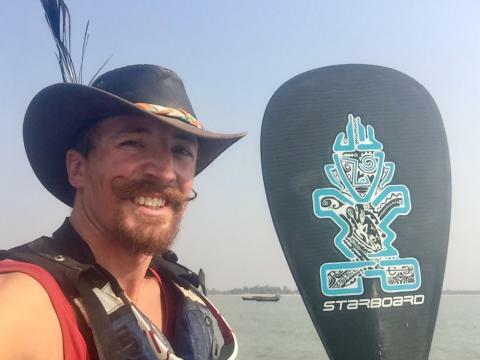 As well as raising money for WaterAid India, Spike hopes the challenge will encourage people to think about pollution in their own local rivers, including the River Tyne in the North East, where he lived for five years. 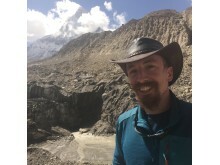 Spike, who graduated from Northumbria in 2005 and then spent two years serving as Students’ Union president, said: “The expedition was undertaken to raise awareness of the many challenges facing The Ganges. It is the holiest river for Hindus and supports more people than any other river in the world, with 450 million Indians, Nepalis and Bangladeshis living within its basin. “However, human waste and single-use plastic pollution end up in the river in large quantities. This is an issue of global relevance and urgency as all this waste and these pollutants end up in our oceans, endangering marine life and eventually finding their way into our bodies through the food chain. Spike was joined by team mate Shilpika Gautam for the expedition, with the pair starting 4,000m above sea level at the Gangotri Glacier in the Himalayas. From here they hiked 150km then cycled a further 150km before launching onto the river on stand up paddleboards at Devprayag, where the Bhagirathi and Alaknanda Rivers join and form the Ganges. During their three-month adventure they tackled white water rapids and encountered a variety of wildlife, including the endangered Gangetic river dolphin, turtles and a water snake. Spike and Shilpika were joined on different stages of the journey by Pascal Dubois of Germany, Galen Hecht of the USA, Neil Irwin from the UK and Kumaran Mahalingam of India, with some of the cost of the expedition met through crowd-sourcing. Parts of the expedition were filmed and will be shown on Discovery Channel India, with a documentary also planned to be broadcast in the UK. This is not Spike’s first experience of adventure – in the past he has led expeditions to countries such as Afghanistan, Kyrgyzstan, Siberia and Nepal and spent seven months circumnavigating the globe investigating the human impact of climate change. He is passionate about stand-up paddle-boarding and has previously paddle-boarded around the Caribbean island of Martinique, across the breadth of England and the entirety of Portugal’s Algarve. 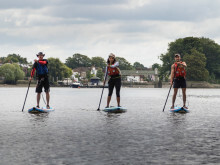 Last year Spike paddle-boarded the length of the River Shannon in Ireland with the Ganges team as part of the training for the Indian river. They were the first people ever to do so. Spike and his team mates were vaccinated against hepatitis, typhoid, tetanus and polio ahead of their trip to India and carried a range of antibiotics while undertaking the challenge to protect them from dysentery. Approximately 450 million people – over 6% of the world’s population – live and work within the Ganges river basin, which has led to it becoming filled with rubbish, sewage and agricultural pollutants. It is estimated that the river absorbs more than a billion gallons of waste every day. The Ganges is also the most sacred river to the Hindu religion. Many bathe in the water as an act of purification and millions of bodies are cremated or immersed in the river following death.